Topic: VST vs AU plugins? Re: VST vs AU plugins? I have found numerous topics on the forum, that have answered my question. Is there any benefit using one above another on Mac? I have, as an example, PianoteQ that installed both AU and VST plugin of the same instrument. Again question, putting this on the top. Is there any pad hardware available that provides not only 4 and 3 layouts (as Push) but also minor and major thirds (3, 4), perfect fourth (5) and perfect fifth (7) in chromatic layout? Topic: Program preferences / settings file location? Re: Program preferences / settings file location? You just Open Location from AL (right click inside the browser) and see where you want to put it. Thank you very much for the answer and tip! What is the Volume envelope inside of the clip? I try to edit that and get nothing. It would be really great to have that to work with Volume. Topic: The best tool for annotations, info text, lyrics...? The best tool for annotations, info text, lyrics...? So far I use an empty MIDI track where I place empty MIDI clips and rename them into the text I need such as "here needs to be cleaned" or "these lyrics here...". Oh yes, that is a good feature. Except multiple MIDI clip editor, are there any other MIDI features that are unique and very interesting in version 10? I mostly work with MIDI, and with MIDI plugins (both standard and M4L, but not step seq). 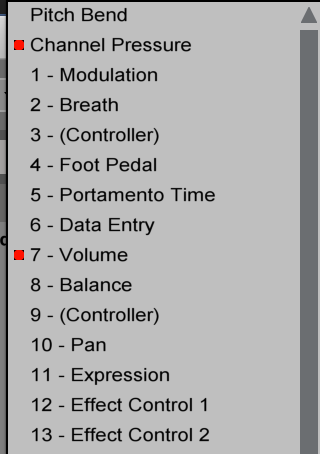 Is there any way, a shortcut, to temporarily disable MIDI inputs? Sometimes I want to check something on my keyboard, without it actually going through Live.